Home | Medical Satire | Are Redheads Bleeders? I first became aware that redheads were treated differently in medicine when I started hanging around anaesthetists. Most anaesthetists i know tend to get slightly more uptight when they see the phaeomelanin-laden locks of a freckled UV-sensitive patient. Especially in obstetrics. Why is this you ask? “Because redheads bleed”, is the answer often given. But is this just an example of confirmation bias? Do doctors selectively remember those of our redheaded patients that have bleeding complications or is there something to it? I’m not the first to ask this question but until now I haven’t known the answer. Redheaded children have similar rates of post-tonsilectomy hemorrhage as non-redheaded children. Redheaded women have no difference on coagulation tests, platelet function tests or other laboratory-based haemostatic tests. Redheaded women do report more bruising than dark-haired women. Why do redheads report more bruising? This finding came out of a study where the investigators were not blinded to the subjects hair colo(u)r, so observer bias, not to mention recall bias, may have confounded this finding. Given that their tests of haemostasis appear normal other factors may be important. Perhaps bruises are more noticeable in those with fair skin. Differences in vascular fragility and non-detectable haemostatic factors, or simply redhead-specific female clumsiness, cannot be excluded. But could there still be another reason for the bleeding prejudice against redheads? Perhaps it is the inevitable association of red hair with ginger (of the Zingiber officinale variety). Ginger is commonly used as spice but is also used by herbalists to treat symptoms such as cough, abdominal pain, diarrhoea, nausea and motion sickness. Of greater relevance is that ginger can give people a tendency to bleed. Ginger may interact with the anticoagulant warfarin, inhibit platelet aggregation (by inhibition of thromboxane production from arachidonic acid) and increase fibrinolysis. 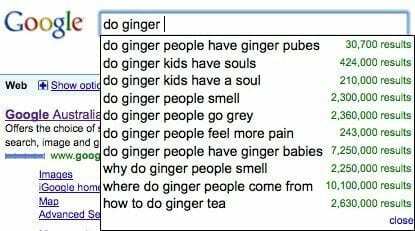 So, it appears that ginger and bleeding are linked after all. There you have it, it looks like gingers, sorry, I mean redheads, are normal people after all. They may even have souls.